If you have an earlier server version, you can download an archived version of this article. Curious how the quality of your content develops? Which content scores the highest? 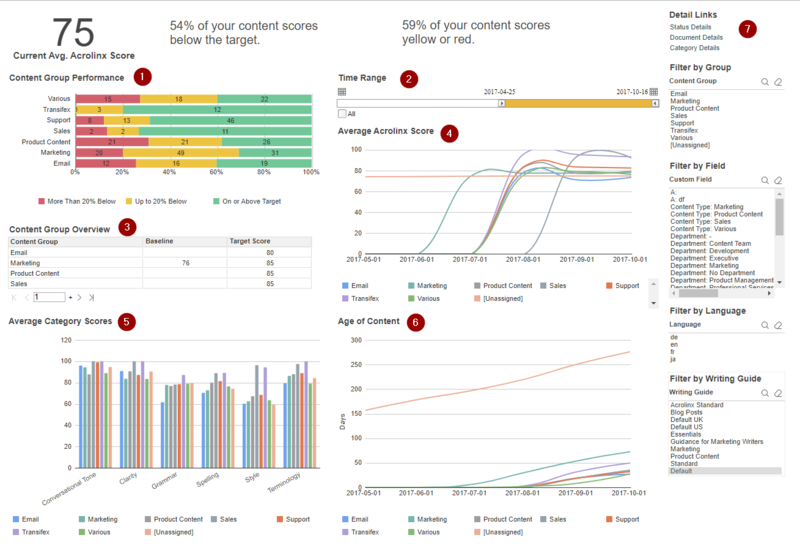 Here you can analyze the Content Groups in relation to the baseline and target score. This dashboard offers a great deal of charts and options, so let's dive right in. Content Group Performance Here you can see how many documents within a Content Group are on or above the target score. You might want to review content that scores more than 20% below the target score. Time Range You can easily adjust the tíme range for the Average Acrolinx Score and Age of Content charts with the scroll bar. Content Group Overview Compare baseline and target score of each Content Group and see if they match. Average Acrolinx Score View how the average Acrolinx Score of each Content Group develops over time. Average Category Scores This tells you what the current average category sores for each Content Group are. So, you can quickly identify outliers and understand differences between your Content Groups. Age of Content Is your content outdated? See how often Acrolinx checked your content. The assumption is that if content isn’t checked, it isn’t edited. For each content piece in a Content Group, we look at how many days have passed since the last check. We take an average of all content pieces within one Content Group. For example, if there are three content pieces in a Content Group, one of which was checked 10 days ago, one 20 days ago, and one 30 days ago. The chart would show 20 days as the age of the content in that group. Note: The data on the top of the dashboard isn’t dependent on the filtered time period. It displays the current status of the content. You can also open more detailed web reports. Status Details What's the status of each Content Group? See the average Acrolinx Score, the number of checked documents and more details in one table. Document Details Take a closer look at your documents. When was the last check? What's the Acrolinx Score? Category Details Compare the category scores of each document and the average category scores of each Content Group.